Safety Scan specializes in the use of optical gas imaging that uses infrared thermal imaging to locate hydrocarbon gas leaks. 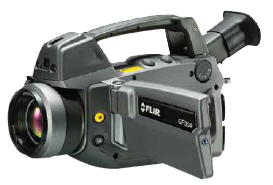 We use a state-of-the-art technology known as Flir GF320 gas finder video cameras. These highly specialized infrared cameras deliver real-time thermal images of gas leaks. Optical emission detection is a relatively new technology that has been developed to provide rapid, accurate and safe identification of fugitive gas emissions. This technology enables the operator to “see” emissions of hydrocarbon gas that are normally invisible. The thermal imaging facilitates precise identification of the source of the leak, essential for repair activities. Optical gas imaging with Safety Scan’s Flir GF320 cameras allow you to easily scan those hard-to-reach or inaccessible areas from a safe distance. This creates a safer, more efficient environment for a variety of industry applications, allowing engineers to identify the source and amount of the leak in real time. With Safety Scan, smart gas leak detection is done the right way. Monitor and detect leaks of toxic gases on your worksite or facility, such as methane, butane, propane, and more — before it’s too late. Contact Safety Scan to get started.